In this post we will see how L3 – Inter Controller Mobility works. I have slightly change my topology to test that. Notice that I have assigned different interfaces (Vlan 12 & Vlan 14) for “guest” WLAN in two different controller. 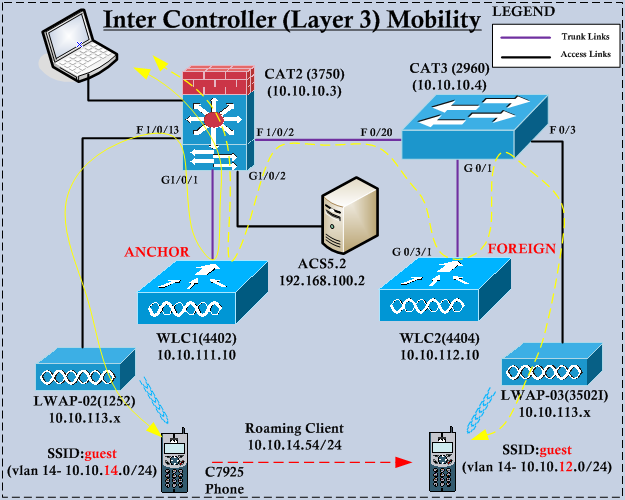 Therefore in this instance when client move from LWAP-02 to LWAP-03 Anchor-Foreign mobility relationship to be maintained to keep the original IP of the client. First will ensure my C7925 client is on WLC1 with vlan 14 IP. You can check client details as shown here. Not complete output shown & filtered for required information. Now will remove this client from WLC1. In this case client will de-authenticate from LWAP-02 & associate to LWAP-03, but because of different subnet (Vlan 12) in WLC2 for “guest” WLAN, WLCs has to have Anchor-Foreign set up. In this way WLC1 send a copy of client database entry to WLC2 where WLC1 mark entry as “Anchor” & WLC2 mark entry as “Foreign”. Note that even though client in WLC2 on vlan 12, still keeping the previous IP of vlan 14. Also note the difference in client association protocol detail for two different controller. In Anchor it is shown as “mobile” where as in foreign it show “802.11a” for my client. In this roaming scenario PoA (Point of Association) moved to WLC2 – Foreign where as PoP (Point of Presence) still in WLC1 -Anchor. Therefore client traffic will go to Foreign->Anchor->Wired Network. If you want to understand this in great details you can run debug commands to verify the exact process of L3 client roaming. Here is the debug output on WLC2 (when client roam from WLC2 to WLC1). I do not think I have time to go into that level 😀 & my objective is pass CCIE lab. *apfReceiveTask: Mar 17 00:05:53.195: 00:1b:d4:58:e6:1a apfMmProcessDeleteMobile (apf_mm.c:548) Expiring Mobile! *pemReceiveTask: Mar 17 00:05:53.203: 00:1b:d4:58:e6:1a 0.0.0.0 Removed NPU entry. here is the debug output form WLC1 where client moved to. You can read “Deploying & Troubleshooting Cisco Wireless LAN Controllers” by Mark Gress, Lee Johnson to go in depth about Mobility. I’m trying to simulate inter-controller L3 in my lab. The topology is WLC1-LWAP1 and ssid mapped to interface vlan11 / WLC4-LWAP2 and ssid mapped to interface vlan12.Mobility is up in both WLCs. The problem is that when i deauthenticate the client from LWAP1 and roams to LWAP2 it doesn’t keep the original IP (vlan11) and acquires new ip from vlan12. In both controllers mobility state is local. Do i miss something obvious? By the way, i have created a blog “chriscciew.blogpress.com”. I have used as reference your blog,in every article i mention the sources i use. Hope there is no problem. Hi Rasik, does inter-L3 roaming also works in “new mobility” across 5508/5760 WLC’s setup with same SSID and different IP subnets? It works, but inter-operability between these two will not test thoroughly when future code releases. As of 8.1 MC function is not supported in AireOS for the same reason. As you know it is very hard to troubleshoot CA, if you mix AireOS in to this, it will get more complex. When I drafting the wireless setup with 5760/5508 already half way of topology became complicated to handle. Pls share the link if you get official note from Cisco.